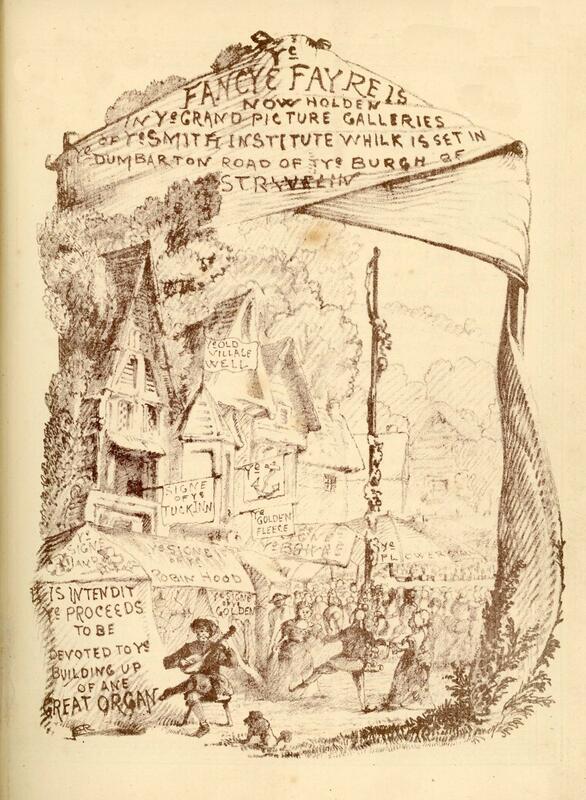 The bizarre bazaar held in the Stirling Smith, formerly the Smith Institute, 24 – 26 August 1882 is one of the stranger episodes in the museum’s history. After complaints that the main gallery of the Smith was being hired out for concerts and other activities which were doing damage to the paintings, Stirling Burgh built the Albert Halls for concerts. However, the new hall needed an organ, and for three days, the Smith was turned into a mock mediaeval English village, with a market cross, fish pond, Punch & Judy stall and Gypsy Camp, to raise the £2300 required. The ladies of the county staffed the stalls and shops, and refreshments were served in Ye Tucke Inne. Carnegie and Gullachsen, furniture makers of Newcastle upon Tyne, were commissioned to build the structure. The illustration is one of many done by art master Leonard Baker for a 50- page hard backed brochure which commemorated the event. The text was written in cod English of the worst kind by the Reverend J D H Thomson and published by Robert Shearer, book seller and printer of 6 King Street. Baker and Shearer lived close to the Smith in Albert Place and Queen’s Road. The bazaar raised £2730. The Albert Halls organ no longer exists.